Emma's not sure that LA's for her, but when she accompanies her sister Jane to an audition, a chance meeting with a teen TV star starts to change her new sunshine lifestyle for the better... But what about Oscar, so far her only friend in LA, who's turning out NOT to be the idiot she thought he was? Soon Emma begins to find herself torn between two boys and reconsidering her entire future. Oscar's wearing a relatively normal outfit today: skinny jeans - except they're bright green, so he looks a little bit like a poppy - and a black, short-sleeved T-shirt, and I can see the muscles flexing in his arm as he manoeuvres the car. I would never have imagined that Oscar had muscles in his arms or anywhere else. Combined with the fact that he's actually driving,well... it's distracting. I just think people will try to put you off doing what you want to do - I don't know why they do that, but they definitely do - but if you really want something you have to ignore everyone else and do it anyway. I'm sorry to have intruded on a private and not at all mental moment. "You just want to see my bedroom,"he says, raising one eyebrow. "You're right. I've been trying to get you up there since I saw you were invisible from the waist down." 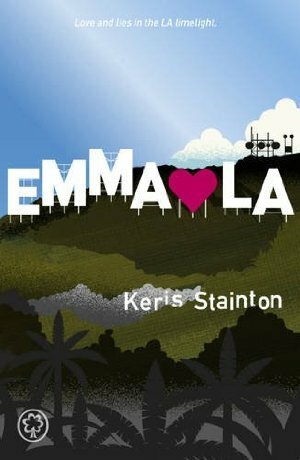 Emma Hearts LA was an adorable, quick read. A perfect little treat for long summer afternoons on the beach. While it's not exactly a book that will change your life, it's most definitely an enjoyable, charming book with a simple but solid plot line, and characters that you'll adore. I honestly did not expect to like it that much, heck - I did not expect to like it all! - but I couldn't help falling under its charm. In the end, this book proved do be really fun and entertaining, and although I did have a few problems with it, they were small and easy to overlook thanks to this book's undeniable sweetness and readability. As much as I enjoyed this book, I can't say that I instantly fell in love with it. In fact, it took me about 100 pages to actually get into it. It was mainly due to the fact that the first 100 pages or so act as nothing more but a set up for the love triangle that comes later, and, for a book that is only 250 pages long, it's a very long set up. That is not to say that the first part of the book is totally meaningless and unnecessary. Yes, it could be a bit shorter, and yes, I would certainly like to get to the point a bit faster, but the part about Emma moving to LA, and Bex getting invited to a movie casting and learning the ins and outs of show business, was very interesting to read about, too. I guess what I'm trying to say is: Try to keep an open mind, enjoy the ride, and don't give up on this book too early. It's a book worth sticking with all the way to the end. The second part of the book makes up for the first, slower one, and if you push through and keep on reading, you'll be rewarded with a cute, sigh-worthy love story, funny dialogues and perfectly satisfying ending. While it's clearly a spin-off of Jessie Hearts NYC, it's also a book that stands entirely on its own. You do not need to read about Jessie's adventurous to be able to enjoy reading about Emma's. Both books are stand-alones, and although they share some of the same characters and ideas, there is nothing that could prevent you from enjoying one without knowing the other. Overall, this was a great, quick read that kept me pretty entertained all the way through. I enjoyed the funny dialogues and thought that Keris Stainton did a great job depicting teenage relationship's, with all their angst, idiosyncrasies, and occasional awkwardness. She made me believe in these teenagers and care for them. And although the romance part was missing steam and chemistry, I most certainly appreciated the humour and lightness of it. It's a drama-free book, and I wouldn't have it any other way. I recommend this book for a quick, summer read! Hachette Children's UK has generously offered to give away one paperback copy of Emma Hearts LA to one lucky INTERNATIONAL reader! 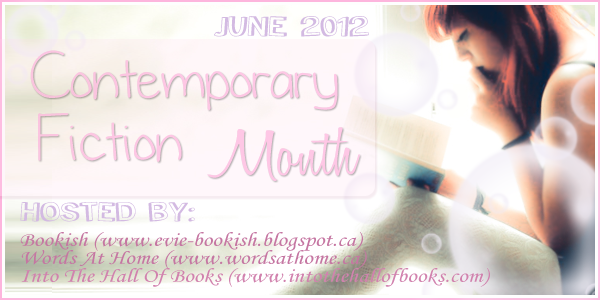 This review and giveaway is posted as part of the Contemporary Fiction Month feature! Click on the picture for full schedule. Evie is the Blogger behind Bookish. She enjoys reading many different genres, especially YA, Paranormal, Contemporary Fiction and Fantasy. She loves talking to authors and is always happy to welcome them for interviews, and guest posts. She also likes spreading the love for awesome books and chatting with fellow book-worms. This looks so good! I am in the US. i hate when a book is slow at first, but I always give it a chance. Maybe they intend to save the best for the end! Hope I still enjoy it! You're right 100 pages is a very long set-up. It sounds like the rest of the book is pretty good though. I think it would be a good summer read. Thanks! i think i'll love this book.. It sounds like even tho you liked the book, it was not a challenging read. I think you're right when you say it would be a good book to read on the beach. Now, I just need to find one!! I've seen a little about EMMA HEARTS LA on the Internet. It does look like a wonderful read. Thank you for your review. With all the books that is all about vampires and all, this is definitely a nice break with all of it. Looks really great! I need to read this book!! It sounds awesome! I'm a little worried about the "slow start" though. But I'll give it a try! When I first saw the cover for this book, I wanted to read it. And then I saw that it was part of a series... Really glad you said it could be read as a standalone! :) Great review! I've heard many great reviews about this book but I'm always kinda hesitant to check it out because I don't read much contemporary fiction and romance, I'm more on PNR. But I guess it's not so bad to try other genres, right? Hopefully, I'll try to read this one even if I don't win. Most of the time I can read through slow books because I know something awesome is awaiting me at the end. It's been that way for old favorites of mine. I'm sure that this is one of those types of books! I like that this is a refreshing read. That is what it seems to me. I would love to read something like this to take a break from all the 'problematic' storylines. This definitely sounds like something I'd get my hands on. I haven't read the author's previous book, but I wouldn't mind reading this one. Sounds like a fun contemporary read! Thanks for bringing this book up on my radar. I'm thankful for a chance to read the book. Thanks for the heads up on the extra long lead in to the body of the story. When I go to read it I'll remember that and not give up too soon. I would love to read this book. Please enter me in contest. The plot sounds intriguing. But I am on the fence knowing that almost a third of the book is not good. A fun, entertaining read is just perfect for the summer. Sounds good. Thanks. To be honest I have never heard about this book before. Sounds good though. Love finding out about great new books! Thanks for sharing your thoughts on this one. It's definitely going on my to be read list! Love contemporary novels and there isn't enough focus on them in the YA community. Thanks for giving one away.